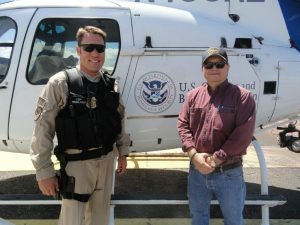 The mission of Customs and Border Protection is to protect our nation from threats seen and unseen. We continue or conversation with the men & women of our nation’s largest law enforcement agency. Today’s interview involves a special emphasis on the Air and Marine Operations (AMO). AMO is comprised of approximately 1,800 agents, 240 aircraft and 300 marine vessels. They operate a variety of both fixed and rotor wing aircraft, marine vehicles and even unmanned aerial vehicles. Their mission includes interdiction, investigations (to defeat criminal networks), domain awareness and contingency operations/ national tasking missions. An example of the last includes providing security for major national events like the Super Bowl and responding to natural disasters. In 2015, AMO enforcement actions resulted in the seizure or disruption of 230,579 pounds of cocaine; 719,549 pounds of marijuana; 1,427 weapons and 49.3 million; 4,485 arrests and 51,130 apprehensions. Our AMO guest is a US Marine veteran who still serves as a reservist. He is dual rated to fly both rotor wing and fixed wing aircraft. Members of two other Customs and Border Protection agencies join us to discuss how all three agencies interact and support the overall mission. While their primary mission is to protect national security, very often they are also saving lives. Two of our three guests are former military members. Customs and Border Protection careers can be particularly advantageous for military Veterans and CBP was recognized as one of the best employers for Veterans in 2016. In addition to high salaries and the ability to retain retirement credits, the geographic stability is something that many former military members find attractive.